I finally got tired of spending $4's for a container of fresh granola. I've always know that it is very inexpensive to buy your own rolled oats and make granola yourself. It turned out that coming up with a homemade granola recipe is a little more challenging than I thought. I didn't realize that you need to turn the granola often while it is cooking or the edges will brown too much. Over cooked granola is really not tasty. I also didn't realize that you need to turn the granola often while it is cooling or it will turn into hard chunks. It will also stick to your baking pan. It is very important to use a baking mat or parchment paper even it your baking sheet is non-stick. I learned this the hard way...hours of soaking and scrubbing my non-stick tray trying to remove stuck on granola. I also played a lot with sweeteners. Most recipes for granola that I looked at required both honey or maple syrup and cane sugar. I figured out a mixture that I think is sweet enough that doesn't contain any white cane sugar. Play around with the additions. You can substitute any dried fruit for the cranberries. Keep or take out the pumpkin seeds. Walnuts can be replaced by almonds or any nut you choose. This is the beauty of homemade granola you get to save money, and have a mix that is just to your taste. 2) Line a rimmed baking sheet with a baking mat or parchment paper. 3) Mix oats, salt, oil, and maple syrup together in a large mixing bowl. 4) Spread mixture over the baking sheet. 5) Bake for 15 minutes before turning the mixture. Make sure you get the edges mixed into the granola so it cooks evenly. Do this step in 15 more minutes. 6) If the granola is not light brown after 30 minutes of cooking. Check it every 5 minutes until it is golden, not brown. Keep turning it. 7) When you remove the granola from the stove use a spatula to turn it well. 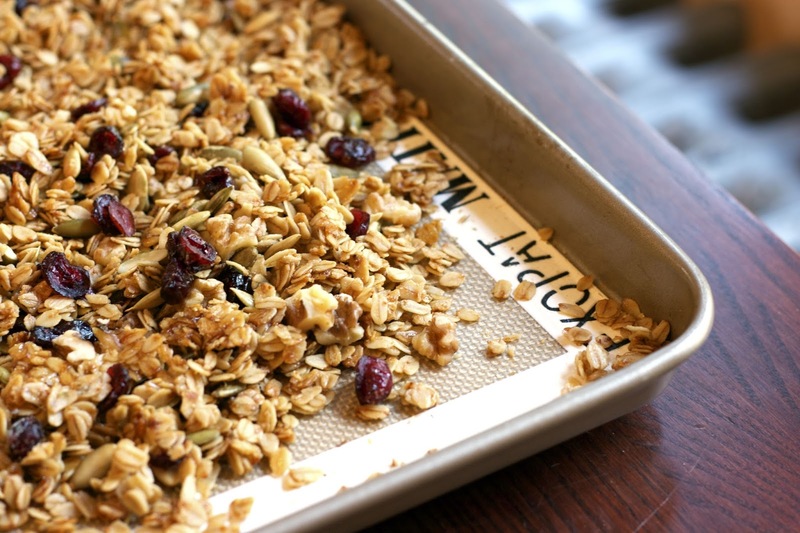 Add pumpkin seeds, cranberries and walnuts to the granola. Turn it every 5 minutes until it cools, so it will not become chunky. 8) Store in a air tight container for up to a month. I kick myself every time I buy a bag (and 4$ seems to be the low end of the granola scale). I especially like your meal plan for this week! Don't you. I am so glad I am committed to making it myself. Yes, my mushrooms were amazing last night, really in season. Can't wait to make Armagnac Chicken. I am determined to use all the liquors I bought for FFWD. What a delicious way to start your day- I've got to make some of this! I stopped by from Let's Get Real. I've been wanting to try making granola for a long time. It's certainly a lot less expensive than buying it. I hope you try this one, most of the recipes I looked at were too sweet. Looks really nice, thanks for sharing with Hearth and soul blog hop, pinning and tweeting. 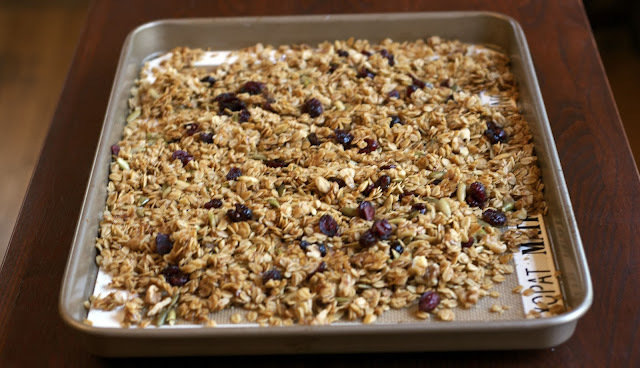 We just love Granola and this looks like a wonderful recipe. I am pinning this one and thanks so much for sharing with Full Plate Thursday and have a great day.